You are invited into a profound process that employs repetitive singing of a mantra with breath to calm the body and mind, and create the conditions for effective one-pointed concentration in meditation. The presentation includes a general overview of pranayama (breathing), demonstration and practice of several pranayama techniques, and a discussion on how to use pranayama and other techniques as effective antidotes to different levels of mental distraction. The practice phase will include the repetitive singing of a Sanskrit mantra accompanied with tanpura (an Indian drone instrument that is used as a background for Indian classical music), guided pranayama practice, and silent meditation. Erik Dennes has been studying and practicing meditation for over 30 years. He practices Kriya Yoga which is a set of meditation techniques and lifestyle regimens from the lineage of Paramahansa Yogananda and is an active member of 3 organizations created by Yogananda and his successors. This instruction lineage has as its foundation the Yoga Sutras of Patanjali. 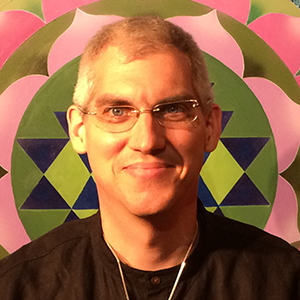 Erik also studies Tibetan Buddhism at the DGCEC and has been an active member since 2006. Music has always been an important part of his life. It has a powerful effect on the mind and body having great potential to quickly relax the body and even provide healing. Erik played guitar professionally in jazz clubs and on cruise lines for a number of years, and later played bass for a church community in Louisville.